The girls tried to get up and found that they couldn’t. The gravitational pull of the planet was keeping them pinned down to the floor of the ship. 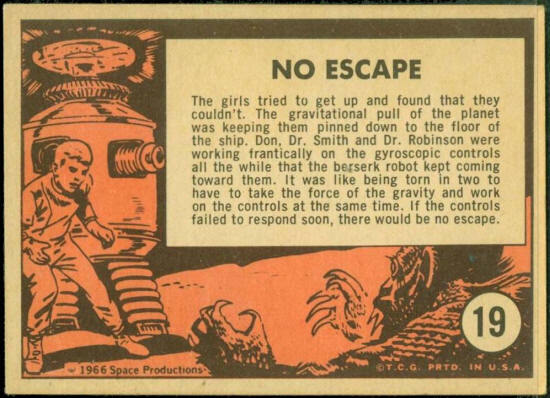 Don, Dr. Smith and Dr. Robinson were working frantically on the gyroscopic controls all the while that the bezerk robot kept coming toward them. It was like being torn in two to have to take the force of the gravity and work on the controls at the same time. If the controls failed to respond soon, there would be no escape.